Botanicals, crystals, beads, and charms mingle to create reminders of your favorite time of year. Celebrate your number one season with a sweet scene encased in glass and wrapped tight in gold- or silver-plated brass. 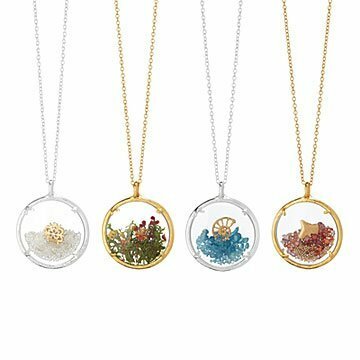 To create these wearable reminders of your favorite time of year, maker Catherine Weitzman blends botanicals, crystals, and beads with playful charms shaped like snowflakes, seashells, and blooms. (Whether your favorite time of year is the dead of winter or the dawning of the spring is up to you.) Handmade in Hawaii. Carefully polish with a clean, dry cloth. My daughter love the winter necklace so much. When I saw her wearing it last week, she made sure to tell me how much she loves it and how many compliments she gets when she wears it. I decided I would buy her spring for her birthday and March. She did not know that all the seasons are represented differently, so I think she will be very excited and happy. The necklace is pretty but looks a bit cheaper than I expected for the price. We will probably replace the chain with something nicer. It is cute how the little crystals and the nautilus shell move around within the pendant. I loved the idea of this necklace. Although it is very pretty, it looks a bit cheaper than I expected. We will probably put the pendant on a different chain that looks nicer. It is fun that the little blue crystals and the nautilus shell move around within the circle.